The Vampire Slayer's Kit That The Stackhouse Family Would Have Had. 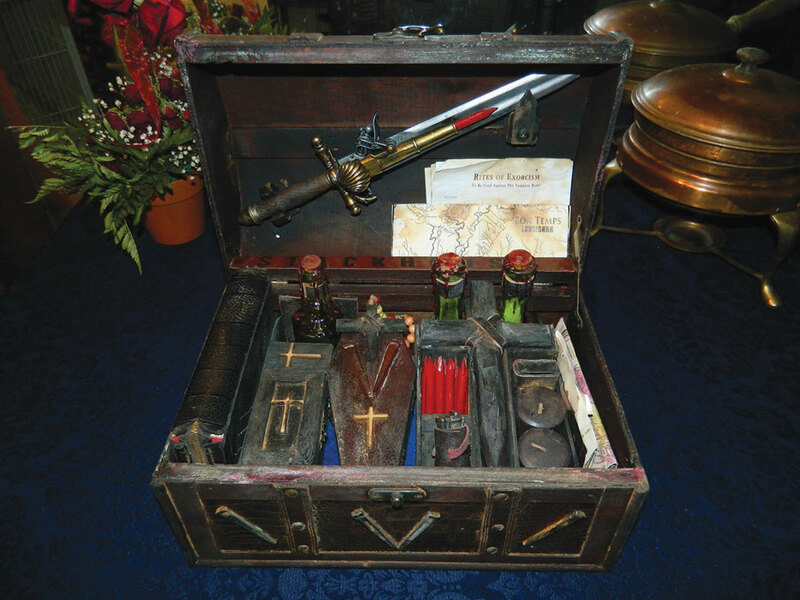 An authentic recreation of a turn-of-the-century Vampire Killing Kit, “Stackhouse” is inspired by the characters and storyline of the True Blood television series. It includes a length of silver chain, cross stakes, mallet, bottles of holy water and rock salt, and a very special combination dagger and flintlock pistol, made to fire .32 caliber wooden stakes directly into the heart of the vampire. This True Blood antique-style vampire killing kit is made with the finest detail, and is a museum-quality showpiece. The unique pistol/dagger has been retrofitted to fire .32 caliber wooden stakes, hand-sharpened and ready to slay the next vamp to infiltrate Bon Temps or your neighborhood. Given to Adele (Sookie’s Gran) in her youth by her half-fairy lover, this kit was custom made for her protection against the growing number of “vampers” invading her home town of Bon Temps, Louisiana. Original design by CRYSTOBAL. Built 2013. This True Blood Vampire Killing Kit is currently for sale on Etsy.